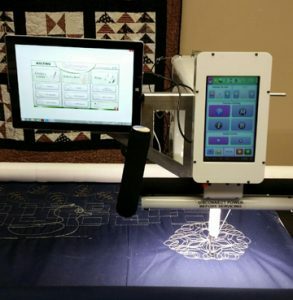 Quilting edge-to-edge designs or blocks with robotic (computer guided) quilting is relatively easy to accomplish. Creating a “custom” border treatment can be accomplished, but it is necessary to think out of the box. We tend to think of stitching borders like we did when hand quilting or quilting on the home sewing machine. For best results with a longarm, we need to begin thinking out of the box, diving the space into smaller, manageable stitching areas, or using techniques that achieve the results with less effort. Most robotic software gives you the option of rotating and flipping which can help in designing and executing border treatments. Here are a few ideas to try. If you have never stitched a border treatment, start with one of the simpler ideas before trying something with a more complicated layout. Dead end borders. Choose a border pattern or squared off narrow panto. Stitch from one edge to the other edge of the quilt top and bottom. Rotate the quilt 90 degrees, load, stitch the same pattern in the border space between the top and bottom border. Don’t forget to flip the pattern to stitch the bottom row. 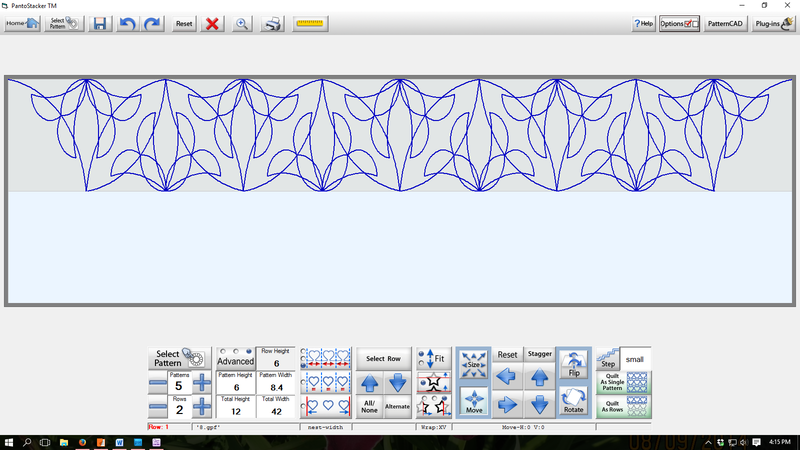 This pattern can be setup in the panto portion of the software and is usually defined with height and width of the pattern. border will be stitched as in #1, but on the top border will start at the inside seam line on the left and stitch to the edge on the right. On the bottom border the stitching will stitch from the inside border seam on the right and stitch to the edge on the left. 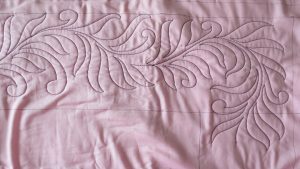 Rotate the quilt 90 degrees, load, and stitch the pattern in the border spaces. Don’t forget to flip the pattern to stitch the bottom row. Out of the box thinking border. Break the border into manageable stitching areas. These can be separated by “corner stones” stitched between the border pattern either using sashing junctions or creating your own separations. 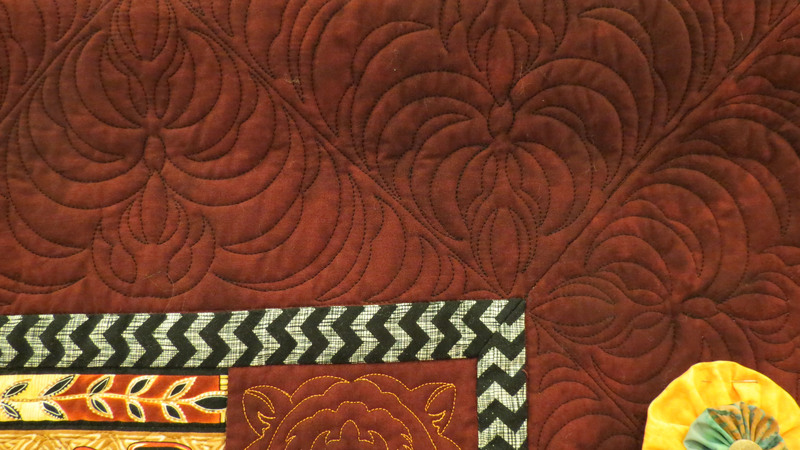 Because the stitching is accomplished in smaller stitch outs, the quilt does not need to be rotated. 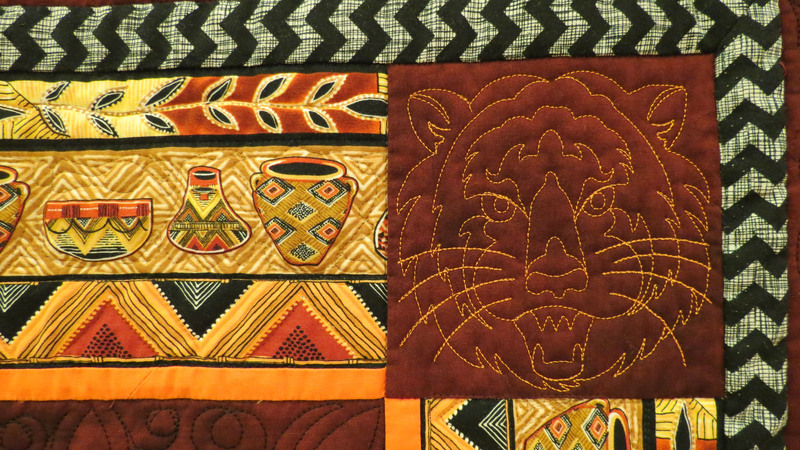 Rotate the pattern to stitch vertically on the side borders. Dead end borders with cornerstones. Similar to #1, but place a different pattern in the corners. The border stitching would dead end at the cornerstone. Border and corner patterns. Many border patterns are also available with a corner connecting pattern. Place the corner pattern first into the corner space and stitch. 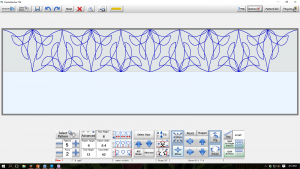 Using the panto setup of the program, create the border using the repeating pattern elements to fill the border space (height and width). Save the design, place it and stitch. Many programs have the option of placing the first and last stitch (connecting to the corner designs), as well as sizing the pattern exactly in the space. Use these options to get the perfect fit. The sample illustrated the corner and border pattern connected just to the right of center in the photo. The corner pattern wraps around the corner while the panto portion simply goes across the border joining the corner on both ends. 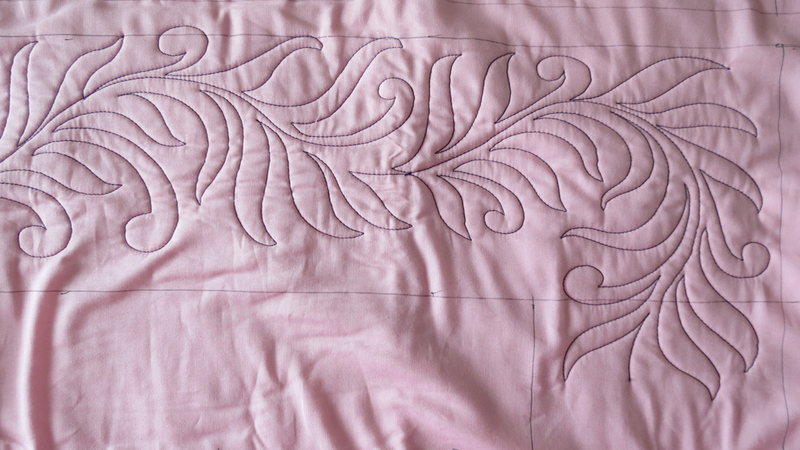 This method would require the quilt to be turned to stitch the side borders. It also takes more skill in working with patterns and using the placement features available with the program. 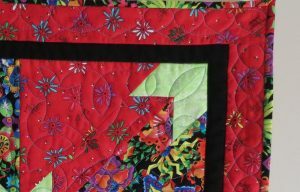 Practice this technique before trying it on a quilt. be sewn like a panto. Select triangle patterns that start stitching on one side of the base of the triangle and stop on the other end of the base. Do not use patterns that start and stop in the same point. Border created with triangle patterns. Use two rows of triangles, one row pointing up, the other pointing down to fill in the space and leave the end with a mitered corner. Offset one row from the other and combine the rows so the two rows fit together. 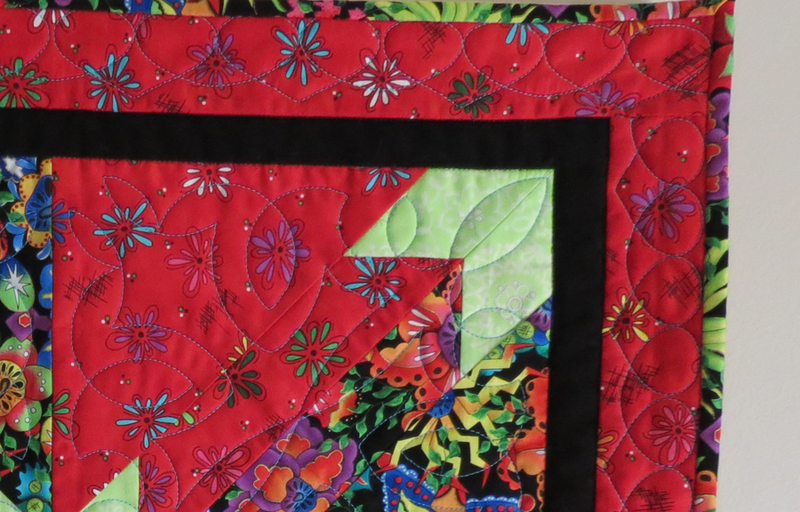 This new panto of triangle units can be quilted onto the top and bottom border. Remember to flip the border on the bottom. 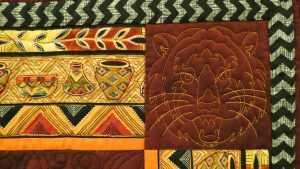 The triangles create a beautiful complex looking border and may be easier than other methods of stitching a border with a computer guided system. The quilt could be rotated 90 degrees to quilt the sides (create a new border if the length is different from the top and bottom). Or, although fussy, the triangles could be placed one at a time to complete the side border. Caution doing this. Make sure you measure carefully when setting the individual triangles so that they will fit exactly in the side border. Stitching borders using a computer guided system can be done. Think about what results you want to see, then, challenge yourself to think outside the box to create it in a simpler way using the features and options available in your robotic software. Nolting “NV” with QM tablet and bracket. Machine color custom white. for the QM tablet which is now mounted on the left side of the machine head. This is a convenient location, although I must say that I find myself wanting to go back to the center tablet (former) location. It is funny how habits are formed and I am sure that with time, I can re-train myself to the new tablet location. Setting up QM with the NV was SIMPLE as the carriage plugs directly into the side of the machine. Very clean and neat. NV has a nice feature allowing up to five profiles be saved. 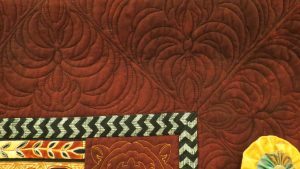 I have set up one of the profiles just for QM quilting. I have the stitch length set for what I want, along with the basting stitch length, and the handle buttons correctly programed to work with QM. Upon first trying QM with the NV I discovered my original handle programing to be faulty. I learned from Lance at Nolting that the single stitch button in QM only interfaces with the red button on the right handle. For QM to operate correctly, the red button must be programmed for the full rotation stitch (down and up). Handle buttons can easily be programed from the profile page and every profile can have different settings. All other functions in QM work as they should without any changes to the NV. In my QM profile, I also set up one of the left handle buttons as a full down/up stitch because I am used to doing it that way. Other profiles could be set up for free motion quilting at the front of the machine, or even doing a paper panto at the back of the machine. The NV has been easy to learn how to use, easy to program the features and has a wide range of spi settings, 4 to 22. Who in their right mind would stitch with 22 spi, I am not sure. I would never want to rip those out if a mistake happened! Nolting NV – custom red paint. QM tablet and bracket. One new stitches available on the NV is the Idle stitch. (gray button on left between the two purple buttons) This is a stitch regulated stitch (4-22 spi, your choice), with the machine idling (slowly running) as it travels in and out of points (you determine the speed), then switches back to the spi setting for normal stitching. This creates crisp points. If you decide to use this stitch with QM, you must be near the machine to use the handle stop button when the pattern finishes as the machine will continue to idle stitch at the end of the pattern. All in all, I give the machine great reviews. 5 stars. Nolting has done their homework in the design of the NV. 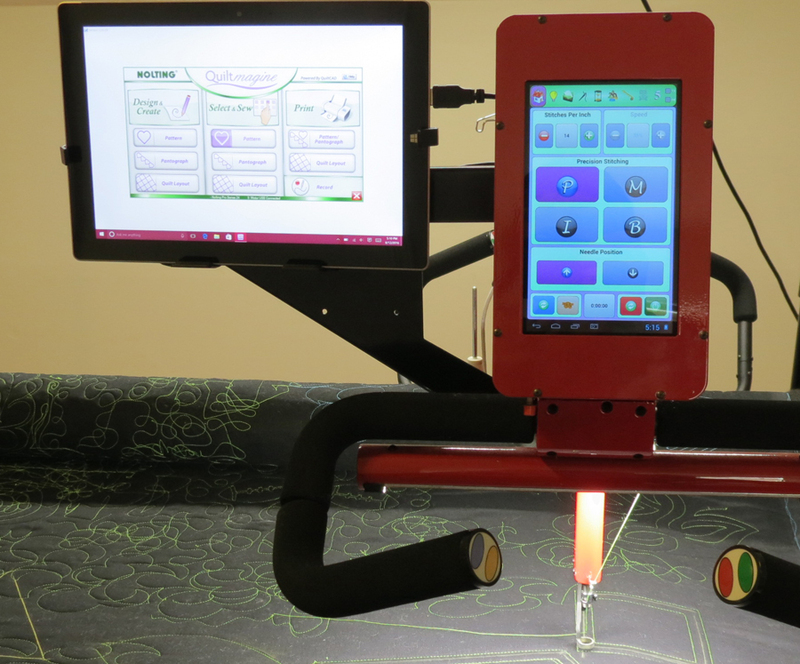 Even if you decide that moving up to the NV is not for you, as quilters upgrade to the NV, there are and will continue to be very nice newer machines that are traded in. Check with your dealer and let them know what you might be interested in and what your budget is so they can keep an eye out for a “newer” Nolting machine for you. Remember, you already own your frame, so would just be trading heads. Computer Guided Quilting – Is It Cheating?